Another day, another trip to Trader Joe’s — also known as one of my favorite ways to break up my day. This trip happened after one of my intensive workouts — a necessity with my eating schedule. Since Trader Joe’s is on the way home, it only makes sense to combine the trip to the gym with grocery shopping regardless of how I look. Alongside my regular list of go-to items, I picked up two new items I’m really excited about. The store was relatively empty in the morning and a few employees were tasting new products and wrangled me in to try them. I’m not one for eating popcorn at 10 AM but I was lured in by the bacon flavoring. Retailing for $1.99 for a 5 oz. a bag, there’s no real bacon in the popcorn; it’s instead substituted with smoke flavoring. I appreciate cheese popcorn already so the added bacon flavor adds a real wallop of flavor. 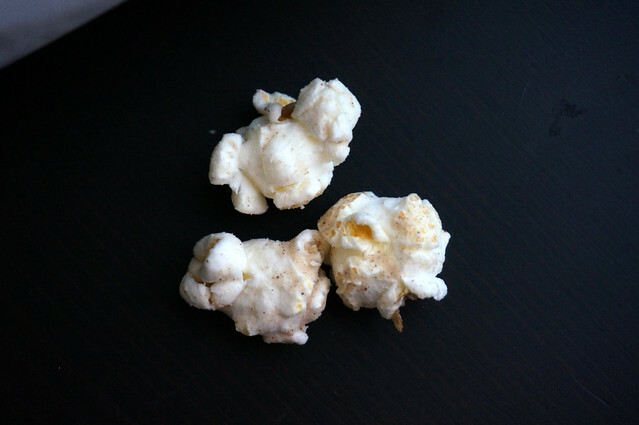 A closeup of the kernels show pristine white popcorn with a light sprinkle of baconesque seasoning. 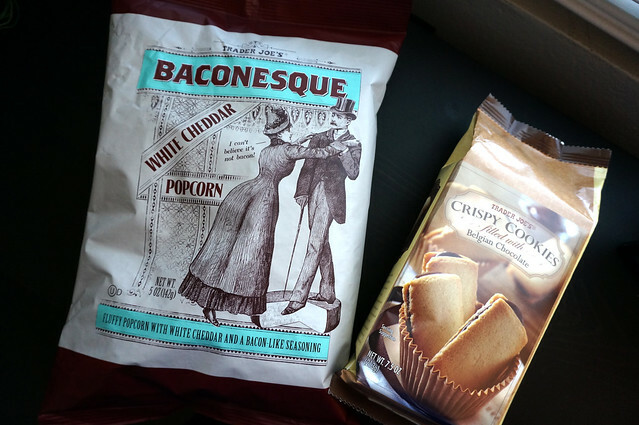 The packaging uses Trader Joe’s old-timey clip art and with the lack of real bacon in the popcorn, the name of the product makes perfect sense. There’s supposedly 5 servings per bag but I can imagine it going fast between two people. The cashier clued me in that these bags go fast so I recommend getting two or more if you have a chance. In the realm of Trader Joe’s knockoff brands, this one is very, very similar to Pepperidge Farms Milanos. 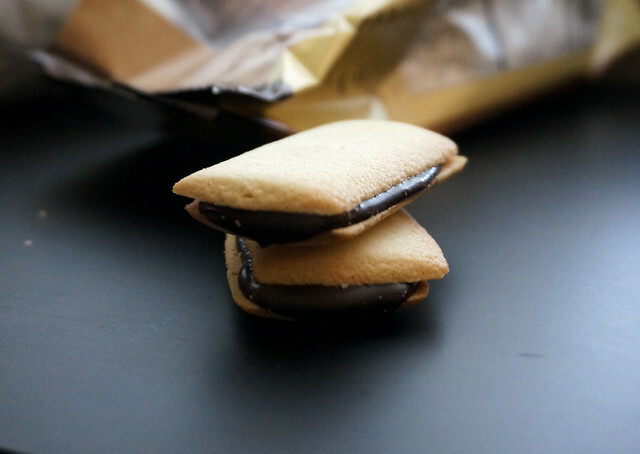 Like its mainstream cookie counterpart, it’s a plain cookie filled with chocolate. Look a little closer and you’ll find some differences. First, the shape. While the Milanos are oval, these beauts are rectangular with a slight rough edge. Taste-wise, the Belgian chocolate filling is a huge upgrade to whatever Pepperidge Farms uses in their product. If I had to pick at one thing, it would be the cookie itself — or maybe that I’m used to the Pepperidge Farm version. It’s drier than the original. Blame it in lard or whatever preservative that’s used in the Milano for the difference in texture, but that alone won’t stop me from purchasing these again if the mood strikes. 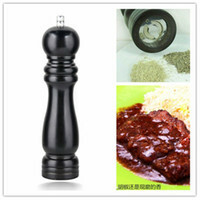 A 7.5 oz. bag of 16 cookie retails for $2.79. I have my gal pal and fellow food writer Erin Jackson to thank for this awesome nugget.